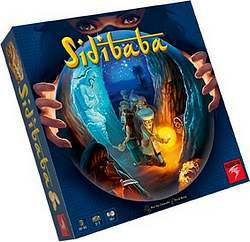 Sidi Baba and his companions, the Adventurers embark on a hunt to find hidden treasure in a dark and mysterious labyrinth. They rely on each other to navigate the maze but in the end… it is every Adventurer for themselves! For it is only the richest who will win this game! To make the journey even more treacherous, the Adventurers are being pursued by the Leader of the Thieves, who is trying to delay Sidi Baba and his companions so they remain forever prisoners of the darkness.